lean lank face nobody has ever seen that any cabbages were sprouting." On the day that Abraham Lincoln became president, the United States was "half slave and half free" as seven states had seceeded to form a confederacy and the threat of a civil war loomed. By the morning of Lincoln's death, the bloodiest war in the nation's history was ending, millions of slaves were newly freed and the union restored. During the intervening years, the United States had changed — and so had Abraham Lincoln. By 1846, thirty-seven year old Abraham Lincoln was a practicing lawyer in Springfield, Illinois, the city in which he had served four terms in the Illinois House of Representatives. Married to the former Mary Todd, he had two sons, Robert and Edward. On August 3rd, Lincoln was elected to his only term in the United States House of Representatives. Also during that year, the earliest known photograph of Lincoln was taken as a companion portrait to one of his wife. Both pictures are attributed to photographer Nicholas H. Shepherd, based on the recollections of Gibson W. Harris, a law student in Lincoln's office from 1845 to 1847. Shepherd, a former druggist, ran a storefront studio in Springfield during that period. Robert Lincoln thought the photos were made later, in either St. Louis or Washington, during his father's term in Congress. The two photographs hung in the Lincoln home and were not duplicated. When Mary packed the portraits fifteen years later in preparation of the move to Washington, DC, she stated, "They are very precious to me, taken when we were young and so desperately in love. They will grace the walls of the White House." The public first viewed this photograph of the young Abraham Lincoln when it appeared in the November 1895 issue of McClure’s magazine to accompany the first in a series of articles on Lincoln's life. The image was made available to the magazine by the President's eldest son, Robert. Both photos were donated to the Library of Congress in 1937 by Lincoln's granddaughter, Mrs. Charles Isham. Suffering from deterioration, the president's earliest known portrait was restored and cleaned in 1959. The equipment used to create this daguerreotype, an early one-of-a-kind photograph, required harsh lighting and for the sitter's head to be immobilized by an iron clamp during the long exposure. As a result, this Lincoln image is not as skillfully produced or flattering to its subject as those that would follow. 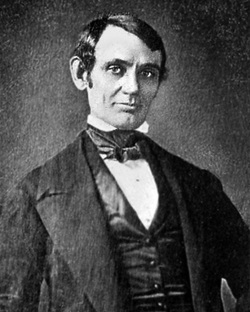 In 1858, Abraham Lincoln was the Republican candidate from Illinois for the United States Senate. His opponent was Democratic incumbent Stephen A. Douglas. The two candidates argued the issue of slavery across their state in a series of seven Lincoln-Douglas debates during the campaign. Their fourth debate was held in Charleston, Illinois on September 18, 1858. On that trip, Abraham Lincoln visited his step-mother, Sarah Bush, who lived in Charleston with her grand-daughter Mrs. Harriet Chapman and her family. Harriet requested a photo of "Uncle Abe" as he was leaving, and Lincoln promised to have one taken and sent to her. 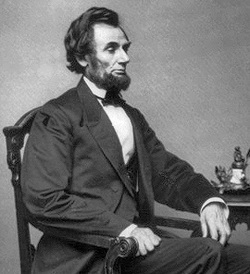 On September 23, 1858, Lincoln posed in the Springfield studio of Christopher S. German to satisfy that obligation. Soon after, Harriet received the photograph already framed with with a letter from Lincoln, in which he said, "This is not a very good-looking picture, but it's the best that could be produced from the poor subject." He also indicated that the picture had been taken exclusively for her. 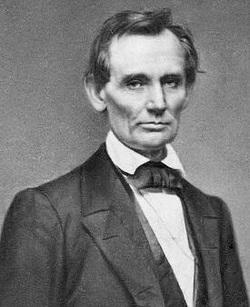 Abraham Lincoln was defeated in the race for the United States Senate but the contest established him as a leader of the Republican Party and one of its most influential speakers. The Young Men's Central Republican Union, a group of important New York politicans, invited Lincoln to speak at the Great Hall of the newly opened Cooper Union, a college located in lower Manhattan, on February 27, 1860. Hours prior to delivering the address, Lincoln went to "Brady's Gallery of Photographs and Ambrotypes," temporarily located only blocks from Cooper Union. This was the studio of Mathew Brady, a photographer known for his portraits of celebrities and politicans. The photograph Brady took that day is known as the Cooper Institute portrait and showed Lincoln to be a strong and dignified man of fifty-one years. Brady had his subject stand with his coat open to create a broader appearance. Clever lighting softened the facial lines that were so pronounced in earlier photographs. 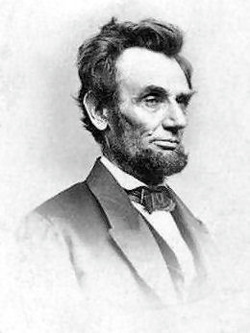 Lincoln's hair was combed to partially concealed his large ears. Props, such as a pillar suggesting strength and a table piled with books symbolizing intelligence, offered a classic setting. Brady retouched the face to eliminiate the dark circles around the eyes and to correct the roving left eye which tended to drift upward. The image was captured on a wet-plate negative, a recently developed technology that permitted repeated duplication of a photograph. Following Lincoln's nomination by the Republican Party for the Presidency that May, Brady's handsome portrait appeared as woodcut adaptations on the covers of two publications, Harper's Weekly and Frank Leslie's Illustrated Newspaper. During the campaign of 1860, lithographic copies were sold and the image appeared on badges and stationary as well as in newspapers. Almost one year to the day after the Cooper Union portrait was taken, Lincoln was photographed in the Washington, DC studio of Mathew Brady as the President-elect. When a friend began to introduce the famous photographer to Lincoln on that occasion, Lincoln stopped him by remarking, "Brady and the Cooper Institute made me President." "If any personal description of me is thought desirable, it may be said, I am, in height, six feet, four inches, nearly; lean in flesh, weighing on an average one hundred and eighty pounds; dark complexion, with coarse black hair, and grey eyes--no other marks or brands recollected." 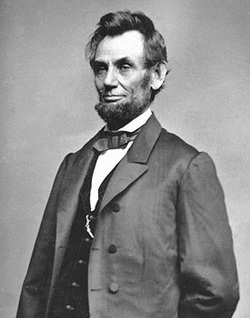 Of a portrait taken of him by photographer Alexander Hesler on June 3, 1860, Abraham Lincoln said, "That looks better and expresses me better than any I have ever seen; if it pleases the people I am satisfied." 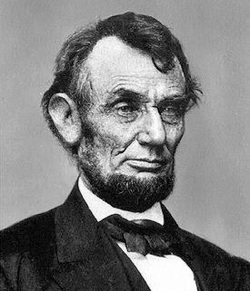 Lincoln's law partner, William Herndon, added his praise when he stated, "There is a peculiar curve of the lower lip, the lone mole on the right cheek, and a pose of the head so essentially Lincolnian; no other artist has ever caught it." Two weeks after the the Republican National Convention of 1860 was held in Chicago, party officials requested that well-known Illinois photographer Alexander Hesler take portraits of the Republican Presidential nominee for the upcoming campaign. Business prevented Lincoln from traveling to the photographer's Chicago studio so Hesler agreed to a sitting at the Old State House in Springfield where four exposures were made. Approximately 10,000 copies of the two most popular "Hesler Photographs" were sold during the presidential campaign. Hesler sold the original glass plate negatives to photographer George Bucher Ayres in 1866. Fortuntately, Ayres moved with the negatives from Chicago to Buffalo, New York before the Chicago fire of October 1871 destroyed Hesler's gallery. Unfortunately, these original negatives were broken beyond repair in the mail during 1933. The ruined negatives were later acquired by the Smithsonian Institution's United States National Museum. Duplicates of the Hesler photographs have been derived since from glass plate positives made by Ayres from the original negatives. "I have got 4 brother's and part of them will vote for you any way and if you let your whiskers grow I will try and get the rest of them to vote for you[.] you would look a great deal better for your face is so thin. All the ladies like whiskers and they would tease their husband's to vote for you and then you would be President." "As to the whiskers, having never worn any, do you not think people would call it a silly piece of affect[at]tion if I were to begin it now?" 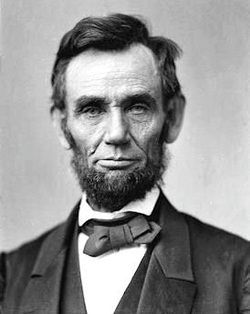 Despite the concern expressed in his letter, Lincoln began to grow a no-moustache beard after having won the Presidential election on November 6, 1860. The growth not only hid the facial flaws to which he himself had made reference to many times before, but added a look of maturity to the youngest man to have been elected President until that time. Having never met his running mate during the campaign, President-elect Lincoln scheduled a five day trip beginning on November 21 to rendezvous in Chicago with his soon-to-be Vice-President, Hannibal Hamlin. While there, Lincoln was urged by his longtime legal associate Henry Clay Whitney to pose for photographer Samuel G. Alschuler. Lincoln had his picture taken once by Alschuler in 1858 during the Lincoln-Douglas debate in Urbana. So, toward the end of the trip on November 25, Lincoln sat for Alschuler again. 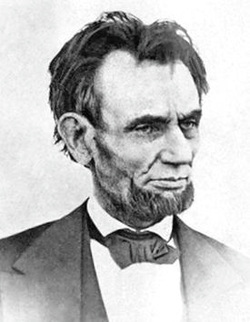 Lincoln's incoming beard was then a goatee beneath a carefully shaved cheek. With his left eyebrow raised, the subject displayed a rather blank expression. Alschuler sent this first known photograph of Lincoln with his sprouting beard to Springfield. Lincoln gave it to Whitney who retained the original copy for the remainder of his life. On February 9, 1861, Lincoln returned to Christopher S. German's gallery to pose for the last photographs that would be taken of him in Springfield before traveling to the nation's capital to become President. 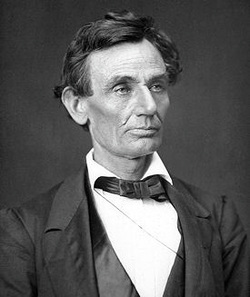 Positioned in front of a tasseled drape and dressed in suit and tie, this photograph shows the evolution in appearance of candidate "Honest Abe," the prairie railsplitter, into the respected leader who would later be called "Father Abraham." The image also reveals the progress of the beard and the lengthening of the hair since late November. Two days later, the President-elect began his long train ride from Springfield, Illinois to Washington, DC. "You see, I let these whiskers grow for you, Grace." Years later, Grace Bedell recalled the meeting, saying "It seemed to me... he looked very kind, yes, and sad." The encounter at the railroad station was reported nationally, but not always kindly. The Highland Democrat, a newspaper based in Peekskill, New York stated, "Old Abe is cultivating his whiskers and kissing the girls along the route" while the New York Illustrated reacted, "'Honest Abe' has cultivated his whiskers and looks as handsome now as the best and greatest of his contemporaries." On February 24, 1861, the President-elect arrived in Washington, DC for the inauguration following an exhausting 14-day journey and having survived an suspected assassination attempt in Baltimore, Maryland. That day, Lincoln visited the Mathew Brady gallery on Pennylvania Avenue. Brady was responsible for the widely circulated Cooper Union portrait the previous year. Lincoln now needed a portrait that demonstrated he was safe and ready to assume office and Brady had been commissioned by Harper's Weekly to photograph the President-elect on his arrival in the nation's capital. Brady had previously informed his associate, Alexander Gardner, by handwritten note that he would be taking the photographs of Lincoln at this historic moment. Gardner requested painter George Henry Story to assist him in posing Lincoln. 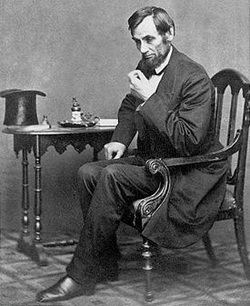 When Story entered the studio, he found Lincoln seated with his left arm resting on a wooden table upon which was his top hat, his right hand clenched in his lap and "wholly absorbed in deep thought." Rather than repositioning the subject, Story said to Gardner, "Bring your instrument here and take the picture." Gardner made five exposures that captured Lincoln's somber expression and majesty. These mass produced photographs became best sellers in the United States and Europe. In it's April 27th issue, Harper's Weekly published a lithograph adapted from one of the Gardner photos accompanied by the statement: "We publish herewith, from a photograph just taken expressly for this paper, a PORTRAIT OF THE PRESIDENT. It is the first accurate portrait that has been published of him since he has grown his beard." The paper incorrectly credited Brady, not Gardner, with the original photograph. Eight days after the Gardner photo session, Abraham Lincoln became the sixteenth President of the United States on March 4, 1861. "I fully appreciate the present peril the country is in, and the weight of responsibility on me. " "You think slavery is right and should be extended; while we think slavery is wrong and ought to be restricted. That I suppose is the rub. It certainly is the only substantial difference between us." This photograph of a seated Abraham Lincoln looking downward, seemingly in meditation, is an undated print. Since historians were unable to determine specificially when Mathew Brady held this photographic session, the image has been referenced as "circa 1862." That is, until recently. In 1941, the Illinois State Historical Library in Springfield acquired a pencil sketch of Lincoln drawn by Arthur Lumley, an artist for Frank Leslie's Illustrated Newspaper. Included with Lumley's signature on the front of the sketch is the phrase "Brady's May 16/61." On the back is written: "This sketch of Lincoln was made from life, while he was waiting to have a photograph taken in Brady's Gallery Pennsylvania Ave. Washington DC 1861. Arthur Lumley." Dr. Thomas Schwartz, Illinois state historian, discovered a "striking similarity" between the undated photograph and the Lumley sketch. Although seen from a differing perspective, both show the President seated with his left hand raised to his face. 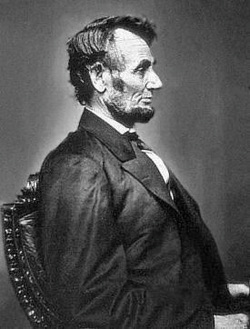 Although historic records had not previously indicated Lincoln was in Brady's studio on May 16, 1861, this discovery established the correct date of the photograph. 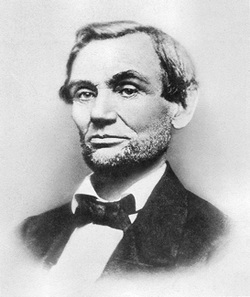 Dr. Schwartz published an article detailing his findings entitled "A Mystery Solved: Arthur Lumley's Sketch of Abraham Lincoln" in the Autumn 2003 edition of the Journal of Illinois History. Waiting as Lumley sketched and Brady setup his camera, what might Lincoln be thinking? During the month prior to the taking of this photograph, Confederates had opened fired on Fort Sumter in Charleston, South Carolina, igniting the Civil War. The President had sequentially issued proclamations calling for 75,000 militiamen to defend the Union and initiating a blockade against Southern ports. Robert E. Lee had resiged his commission in the United States Army and accepted command of the military and naval forces of Virginia. What was the President feeling as he sat motionless during the long photographic exposure? "In the untimely loss of your noble son, our affliction here, is scarcely less than your own. So much of promised usefulness to one's country, and of bright hopes for one's self and friends, have rarely been so suddenly dashed, as in his fall." The first major battle on northern soil during the Civil War was the Battle of Antietam, fought by Antietam Creek, near Sharpsburg, Maryland. This encounter has the tragic distinction of being the bloodiest single-day battle in all of American history, with an estimated 23,000 soldiers killed, wounded or missing. Gen. Robert E. Lee's Confederate Army of Northern Virginia entered Maryland seeking supplies and new recruits during the initial invasion of the North. President Lincoln ordered Maj. Gen. George B. McClellan to halt the incursion, commanding "Destroy the rebel army if possible." On the dawn of September 17, 1862, the Union Army of the Potomac began a series of attacks to drive the Confederate forces from Maryland. After twelve hours of fighting, the Confederate army was pushed back but had not collapsed. Lee's army withdrew across the Potomac River the following night. McClellan's forces failed to continue the pursuit, allowing the Confederates to retreat to Virginia. This strategic victory for the Union provided Lincoln with the opportunity for which he had waited to issue the preliminary Emancipation Proclamation. Issued on September 22, 1862, the document decreed that slaves held in any Confederate states that had not returned to the Union by January 1, 1863, would be free. Lincoln visited Antietam during October 3-4, 1862, to meet with McClellan whom the President criticized for "over-cautiousness" during the battle. Lincoln urged McClellan to resume the attack against Lee's troops during their discussion. Alexander Gardner took six pictures of Lincoln during his time at the Antietam Battlefield. The photograph shown here includes Allan Pinkerton, head of the Secret Service of the Army of the Potomac. Pinkerton was the former railroad detective who managed Lincoln's security during an assassination threat as the President-elect journeyed to Washington, DC in 1861 to assume office. Also shown is Maj. Gen. John A. McClernand, who was a Congressman from Illinois when Lincoln served his one term in the House of Representatives from 1847 to 1849. McClernand accompanied the President to the battlefield. 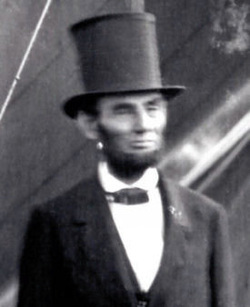 Lincoln is wearing a stovepipe top hat which protected him from inclement weather and added to his considerable height, but also concealed important papers while traveling. A second, similar photo with Pinkerton and McClernand has Lincoln turned slightly to his right. Gardner also photographed Lincoln meeting alone with McClellan in a tent and another of the President standing with Union troops. These were the first photographs ever taken of an American commander-in-chief on a wartime battlefield. In the weeks following Lincoln's two-day visit to Antietam, McClellan still did not follow Lee into Virgina, so he was relieved of his command by the President Lincoln on November 5. The most memorable photograph of Abraham Lincoln was the one taken on November 8, 1863, by Alexander Gardiner in Washington, DC. This full face, closeup clearly shows Lincoln's roving left eye. Reproduced countless times, this image influenced Daniel Chester French's design of the face on the Lincoln Memorial sculpture. Significantly, this dramatic image was made at a key moment in the nation's history and in Lincoln's presidency for, in eleven days, Lincoln delivered his most important speech. From July 1-3, 1863, over 160,000 Americans fought in the town of Gettysburg, Pennsylvania. This battle was a turning point in the Civil War as Union forces decisively blocked the Confederate army's advance northward. To honor the more than 7,500 dead, a national cemetery was dedicated at Gettysburg on November 19, 1863. President Lincoln was invited to attend the ceremony to make "a few appropriate remarks." The speech that the president delivered toward the end of the program lasted just over two minutes and began with the now familiar phrase "Four score and seven years ago..." Known as the Gettysburg Address, Lincoln referenced the Declaration of Independence to redefine the Civil War as more than a struggle to preserve the Union. The conflict would bring "a new birth of freedom," equality of all the nation's citizens, he stated. While giving his speech, Lincoln felt weak and dizzy. That evening, the President had a high fever and severe headache. When he developed scarlet blisters within days, Lincoln was diagnosed with smallpox. During the three week long illness, he became emaciated but survived. The November 8th photo captured Lincoln's image only six days after the formal invitation to speak at the Gettysburg cemetery was sent and while on the verge of a potentially life threatening illness. "Common looking people are the best in the world- that is the reason the Lord makes so many of them." In early 1864, the re-nomination of Abraham Lincoln by the Republican Party for a second term as President later that year seemed in doubt, and the President was about to promote Ulysses S. Grant to General-in-Chief of the Union forces. At that time, President Lincoln posed for a series of photographs during two sessions at Mathew Brady's studio which defined the iconic image of our sixteenth president. 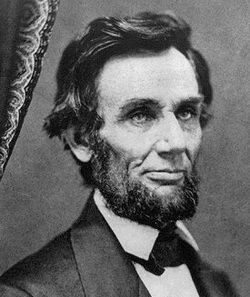 Of the three-quarter right profile taken on January 8, 1864, by Mathew Brady, Lincoln stated, "If I looked like any of the likenesses of me that have been taken, I look most like that one." This image was sold through Brady's New York Gallery as a carte de visite or CDV. French for "visiting card," these albumen silver prints of fine clarity were mounted on small cards typically measuring 2.5" x 4" in size. Cartes de visite of celebrities were sold by the thousands in the 1860s because they were inexpensive and permitted the distribution of photographs when such images were not yet able to be reproduced in newspapers or magazines. This format also permitted relatives and friends to exchange photographs during the Civil War. Today, original cartes de visite of the Lincoln portraits made by Mathew Brady and Alexander Gardner are highly sought after collectibles. 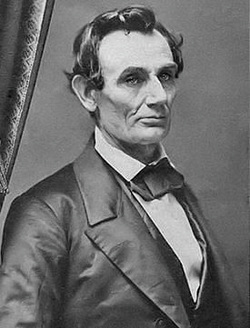 A three-quarter length portrait, with Lincoln standing and facing to the left, was also taken during the January 1864 session. This image was marketed as a stereoview that created the illusion of three-dimensional depth not characteristic of traditional photographs. The effect was achieved by printing two slightly different versions of the same image side-by-side on a rectangular card. By viewing the stereo card cross eyed or with an optical instrument called the stereoscope, the two pictures merge into one having an added dimension. Lincoln's most influential photographic session occurred on February 9, 1864, just three days prior to his fifty-fifth birthday, at Brady's Washington gallery. Photographed by Anthony Berger and posed by painter Francis B. Carpenter, many of these pictures became best sellers and have inspired artists ever since. 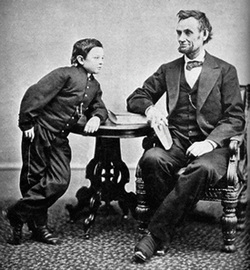 For example, a photo taken of the President with his son Tad as they viewed an album together was sold and adapted countless times after Lincoln's death. Other family members, including Mrs. Lincoln, were inserted into some of the reproductions of this image. Although photographed with son, Abraham Lincoln never had a picture taken with his wife, possibly because Mary stood fourteen inches shorter than he did. One of the portraits from February 1864 served as a model in the design of the penny while two other poses have appeared on the five dollar bill. The photo of the President facing to the right in full profile wasn't widely known prior to its publication in the newspapers of August 1909 to coincide with the release of the new Lincoln penny. That coin replaced the Indian Head penny to commemorate the 100th anniversary of Lincoln’s birth. The face of the coin was designed by portraitist Victor David Brenner and approved by President Theodore Roosevelt. The reverse side featured two wheat ears until 1959, when, for the 150th anniversary of Lincoln’s birthday, that figure was replaced with the Lincoln Memorial. For the bicentennial of Lincoln’s birth in 2009, four different designs for the Lincoln Penny will be issued. While the face shall still bear Lincoln in profile, each reverse side will depict a different period in the President's life: Lincoln’s Birth in Kentucky (1809-1816); Formative Years in Indiana (1816-1830); Professional Life in Illinois (1830-1861); and Presidency in Washington, DC (1861-1865). The Lincoln Penny was the first American coin to feature a United States President. In 1909 some people expressed displeasure that Lincoln's portrait appeared on the penny rather than a coin having greater monetary value. The President's eldest son, Robert, believed the "most satisfactory likeness" ever made of his father was the February 9, 1864, photograph showing the seated Lincoln with coat unbuttoned and a lock of hair falling onto his forehead. Today, this is the most recognizable Lincoln portrait due to its appearance on the five-dollar bill beginning with the Federal Reserve Note of 1914 and continuing until its replacement on March 13, 2008. The redesigned $5 bill now in circulation incorporates a different Lincoln portrait taken by Anthony Berger during that same photographic session in 1864. The photo favored by Robert Lincoln was adapted for Francis B. Carpenter's widely reproduced history painting entitled "The First Reading of the Emancipation Proclamation," the original of which is located in the United States Capitol. Carpenter lived in the White House with the Lincolns while working on his painting and in 1866 published a memoir of the experience, "Six Months at the White House with Abraham Lincoln." These photographs established an iconic image of President Lincoln for generations of Americans. "This war is eating my life out. I have a strong impression that I shall not live to see the end." On February 5, 1865, exactly one week before his birthday, Abraham Lincoln sat for what turned out to be his last studio photographs. The session was held at the recently opened gallery of Alexander Gardner who left the employment of Mathew Brady to work independently. The newly re-elected Lincoln was accompanied by his youngest son Tad and portraitist Matthew Henry Wilson who had been commissioned to paint the president’s portrait. During the sitting which took just over an hour, five photographs were taken. The first had Tad leaning on a circular table beside his seated father who is holding a book. Four individual portraits were variations of the President sitting in a Queen Anne style padded chair, dressed in a plain, vested suit with a slightly askewed bowtie and his pocket watch chain clearly visible. The third of these had Lincoln look directly into the camera with his face in sharp focus. The slight blurring of the hands indicate that he was impatiently fiddling with his eyeglasses and pencil during the lengthly exposure. 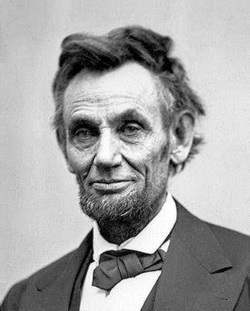 Lincoln appears much older than his fifty-five years and painfully thin. His right eye and cheek appear to be nearly hollow. Gardner did not apparently attempt to conceal either the lines or weariness in Lincoln's face. Next, Gardner took a closer photograph of Lincoln’s head, shoulders, and chest. Unexpectedly, the glass plate negative cracked across the top. Gardner was able to make one print before the negative broke completely and was discarded. This damaged, haunting image was the last one taken that day. Matthew Henry Wilson worked from these photographs to produce a traditional portrait in an oval format that was not especially distinguished. Upon viewing the finished painting, Lincoln noted "that it was horridly like the original," referring to himself. Following Lincoln's death, prints from the February 1865 session at Gardiner's studio were advertised and sold as photographs from "Mr. Lincoln’s last sitting." During the late afternoon of Monday March 6, 1865, just two days after calling for "malice toward none" and "charity for all" in his Second Inaugural Address, the final photograph of Abraham Lincoln in life was taken. That day, photographer Henry F. Warren came to the White House to deliver some prints. Warren asked if he might take some impromptu photographs of the President and Lincoln obliged. Warren took three pictures on the south balcony of the White House as the breeze ruffled the hair of an exhausted looking Lincoln. The spontaneity of this event prevented the care of preparation that characterized the studio sessions of Mathew Brady and Alexander Gardner. Now fifty-six years old and 35 pounds underweight, the President in the Warren photographs had become physically weakened. During a visit to the White House that very month, friend Joshua Speed described Lincoln's hand touch as "cool and clammy." Mary Todd Lincoln became worried about her husband's health, so she urged him to reduce his work schedule and to get more sleep. She also encouraged Abraham to engage in activities he had always enjoyed, pasttimes such as taking carriage rides and attending the theatre. "And well I may feel so, Mary. I consider this day, the war has come to a close." "We must both be more cheerful in the future- between the war and the loss of our darling Willie- we have both, been very miserable." A slide show of Abraham Lincoln portrait photographs and a gallery of Lincoln history images accompany this article.